Abbott retires after 33 years as cathedral music director. Published 10/5/2018. Local. BRAINTREE -- The organist sits down at his instrument. He's still as he waits for his cue, but when he gets it, he comes alive. The keys press down, the pedals pump, and the pipes bellow and hum and sing as the organist plays his song. As the song, an entrance hymn, processes through the cathedral, the artist and his instrument almost seem connected, almost seem like one sonic being. Maybe, in some way, they are. 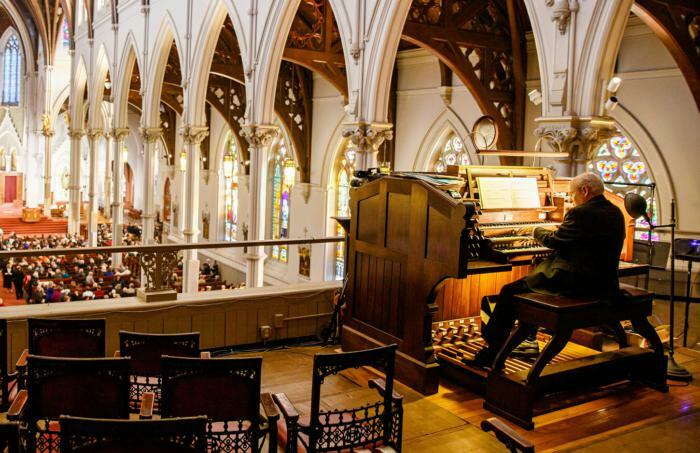 "You know, organists are an odd lot," said Leo Abbott, the recently retired organist and director of music at the Cathedral of the Holy Cross. "Very often, we seem to be created for this instrument. There's some sort of fascination with this instrument -- the sound of it, the look of it," he said. For 33 years, nearly half of his life, Abbott played the Masses and special events at the cathedral, where he served as the director of music and organist from April 1, 1986 until Sept. 1, 2018, when he officially retired from his positions. Speaking to The Pilot Sept. 27, Abbott said the Archdiocese of Boston recently expanded the position to director of music for the entire archdiocese, "and since I recently turned 68, I wasn't interested in starting a new job so close to retirement age." Abbott's years of service, celebrated by a parish-wide retirement party at the cathedral in August and the new title of "director emeritus," have had long-lasting effects for the cathedral and the Archdiocese of Boston. It was Abbott who, some three decades ago, spearheaded a fundraising campaign for the restoration of the cathedral's historic E. and G.G. Hook and Hastings pipe organ, which had been originally installed in 1875. "When I got there in 1986, it didn't even play," Abbott said. "You could perhaps play a single note, and that may play on certain things, and then if you added two more notes it would just stop playing." It took a combination of volunteers and professionals around three years and a lot of hard work to get the organ "at least playing in 1990." The process didn't stop there, with work having been done on in the instrument "little by little" over the years. Abbot told The Pilot back in 2016 that now, the organ is "fairly close to what it sounded like in 1876." During his time at the Cathedral, Abbott has played for a number of major Masses and events, including the installation of then Cardinal Seán P. O'Malley as Archbishop of Boston in 2003. "It is with deep appreciation that the Archdiocese of Boston and the Cathedral of the Holy Cross community congratulates and thanks Mr. Leo Abbott, FAGO, ChM., for his faithful service of thirty-three years as Director of Music and Organist of the Cathedral," Cardinal O'Malley said in a statement. "Leo has lead the choir for many important liturgical celebrations including my installation as Archbishop in 2003 which I remember fondly. From ordinations to weekly Masses, Leo brought the same level of energy and commitment to providing the liturgy with music that lifted spirits and praised God," the cardinal said. "It is an honor and privilege to recognize Leo Abbott with the title Director Emeritus at the Cathedral of the Holy Cross," he continued. While Abbott will no longer be heard regularly at the cathedral, he said he is far from giving up playing. He has a piano at home, an instrument he has been playing since he was eight years old, and plans to continue practicing at local churches and filling in at Masses, which he says will help keep him prepared for the recitals he plans to hold. Over the years, Abbott has held recitals all over the world, performing for audiences in Ireland, England, France, Belgium, and in venues across the U.S.
"Hopefully, now that I have some free time to practice -- which when you're directing the music program at a cathedral you often do not have time to do -- hopefully I'll be able to travel a little bit more and do some more recitals," he said. Abbott's successor is musician and composer Richard J. Clark, who is serving as the director of music of the Archdiocese of Boston and director of music and organist of the Cathedral of the Holy Cross. Previously, Clark oversaw the parish music program at St. Cecilia Parish in Boston. He also served as organist and cantor at Boston College's St. Mary Chapel, and had recently helped direct the music for several archdiocesan services, including the 2017 and 2018 Presbyteral Ordinations and the dedication Mass of the Shrine of Our Lady of Good Voyage in Boston's Seaport District.